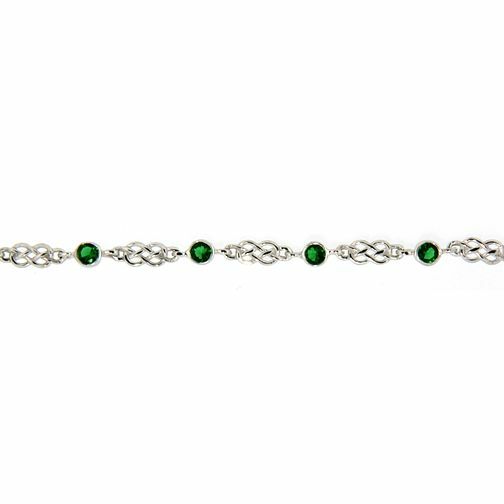 Crafted by traditional Irish jewellers Cailin, this delicate sterling silver bracelet is styled in a Celtic design with deep green cubic zirconia for a splash of rich colour and sparkle. Indulge in classic style that's perfect for every occasion. Cailin Sterling Silver Green Cubic Zirconia Celtic Bracelet is rated 5.0 out of 5 by 2. Rated 5 out of 5 by Anonymous from Lovely gift Product looks good and is well made, with an easy clasp to do up. Recommend as a gift or for a yourself.